All Acosim products are manufactured under strict quality control by Acosim AG in Switzerland. The factory at Schmerikon produces the Acosim System products for the whole of Europe. Lead times vary between 5-10 days depending on the time of year. 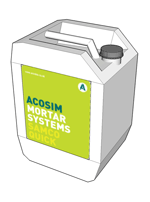 Acosim UK keeps a stock of products within the UK which can be delivered by pallet. Acosim UK can arrange carbon offsets with climatecare. All Acosim products can be carbon neutral for use within the UK and Ireland. © Copyright 2011 Acosim (UK) Ltd.